But when the Land Cruiser was within fifty metres, fear touched the Aborigine and he began to speed up. The Land Cruiser kept coming. The Aborigine realised that he had to get off the track or run the motorcycle flat out. He couldn’t get off the track. The line of gibbers held him trapped as long as he was moving at any speed at all. He turned the accelerator handle to its full range and the powerful machine surged forward, quickly reaching eighty, ninety, pulling clear just as the Land Cruiser came up to it. For a moment the bull bars of the Land Cruiser were within centimetres of the motorcycle. The motorcycle pulled ahead, but riding a motorcycle at ninety on that surface was lethal and the Aborigine knew it. At any moment he had to hit a drift of stones, or soft sand, and there were soaks ahead. The characterisation focusses entirely on the couple. No motivations are offered for the behaviour of the madman or of the minor characters, and there are only three of them, as you’d expect in a remote area. The hunted couple are both city folks with limited survival skills. They acquire a gun, but don’t know how to load it or fire it. They don’t have the right clothes to withstand the harsh sun. They waste water in a profligate way. What character development there is focusses on the way the experience of being hunted warps their basic decency, how they react with a ruthlessness that they didn’t know they had. Is it great literature? Is it like the modern classic, Wake in Fright (1961) which made Cook’s name as an author long before his untimely death in 1987? Well, no, the introduction by Douglas Kennedy says that stylistically it’s pure pulp fiction. He acknowledges wooden dialogue, scanty characterisation, missing psychological insight. You need to give in to its punchy prose, its B-movie sensibility. Because this is a novel which grips like a vice. We’ve all entertained nightmarish reveries about being pursued by a crazy (or, at least I have). Just as we have all wondered what we would do when faced with a deadly situation in which it is us versus them. For me, it works because it’s short. Only 196 pages long, which limits the number of cliffhangers when the madman gets perilously close and then they get away again for a short time. I tend to get bored very quickly by thrillers which pile on the cliffhangers chapter after chapter because they become so predictable. (Turn 6 pages? there must be another one coming). 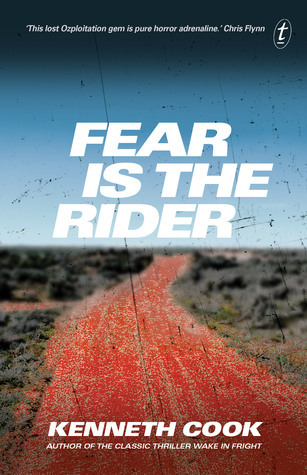 Fear is the Rider takes the time to make each scene work properly, to show the characters vacillating between a wary calm and outright panic, and to maintain a strong control over the suspense. The manuscript has been languishing in Cook’s papers since his death. It seems extraordinary that after all this time it’s been found and posthumously published by Text! Source: review copy courtesy of Text Publishing. This is a page turner indeed just judging from that one extract. Bet you that now the text has been uncovered, the plan for a movie version won’t be far behind. It just screams movie doesn’t it?. Yes, it does indeed. And cheap to make … Only 6 actors!! Glad you enjoyed it, Lisa. My digital galley didn’t come with an introduction, so I’m intrigued that Douglas Kennedy wrote it because I’ve only just learned that he once wrote an outback thriller before he turned to his trademark romance novels. It’s unusual for this type of book to have an introduction, isn’t it? I assumed it was only because it’s posthumously published…. I think all the Text Classics have introductions, though. I don’t read them until I finish the book; I think they should be “afterwords” because they’re usually riddled with plot spoilers. Yes, you’re right about the Text Classics having introductions, and yes, you’re right about avoiding them for the reason you say. There’s usually a bit of a time lag between getting a book and actually reading it, and I don’t usually even look at the blurb before I start reading so that I come to the book completely fresh. The other day a well-known children’s author who I won’t name gave a really bizarre bit of advice to readers – always read the end of the book first because you shouldn’t read a book with a sad ending, it will make you unhappy. (I’m paraphrasing, but that was the gist of it). I have never ever read the ending first, and apart from ruining all the craft that’s gone into structuring the book, and spoiling the reading experience, I think it’s a pitiful underestimation of children to think that they can’t deal with sadness and have to be kept safe with Pollyanna endings! I loved this book, and also read it in one sitting! Couldn’t put it down. Hello, and welcome:) Just imagine trying to get to sleep before you’d finished it! Impossible!